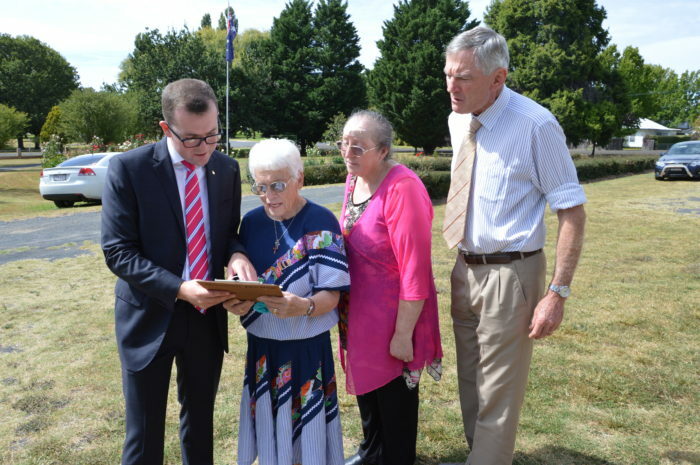 Member for Northern Tablelands Adam Marshall, left, Glen Innes Hospital Auxiliary President Jan Sharman OAM, Treasurer Elizabeth McCarthy and Mayor Col Price looking over the helipad planning brief. THE Glen Innes Hospital helipad looks set to get off the ground soon as detailed design plans were handed over to Northern Tablelands MP Adam Marshall by Hunter New England Health this week. Mr Marshall said the plans had been a long time coming and while he and the community had been patient, the delay allowed Hunter New England Health to ensure that all specifications were met. “I’m just happy that this important project can now move forward,” he said. “I have handed the plans over to the Hospital Auxiliary and Glen Innes Severn Council and now I look forward to the calling of tenders for local contractors to undertake the various components of the works,” he said. “There will need to be lighting, concreting, a new entrance built from the helipad into the hospital so that people can be wheeled directly from the hospital to the helipad, some trees will need to removed around the site and the ground levelled. “So there are all different components to the job and I am excited to get the plans and get this project moving. Mr Marshall said he had successfully lobbied the State government last year to provide the $25,000 required for the development of the plans as he had been reluctant to place that financial burden on the community. “The community has demonstrated it is willing to do the heavy lifting on this important project and the funding support for the preparation of the design plans was a very welcome boost,” he said. Mr Marshall said the helipad will be built on the north east corner of the hospital grounds (corner of West Avenue and Taylor Street) and include a concrete access path to the hospital.